You may have noticed that cute little book cover over in the sidebar. My first book comes out August 31st, and I’ve decided to give my blog readers a little preview. 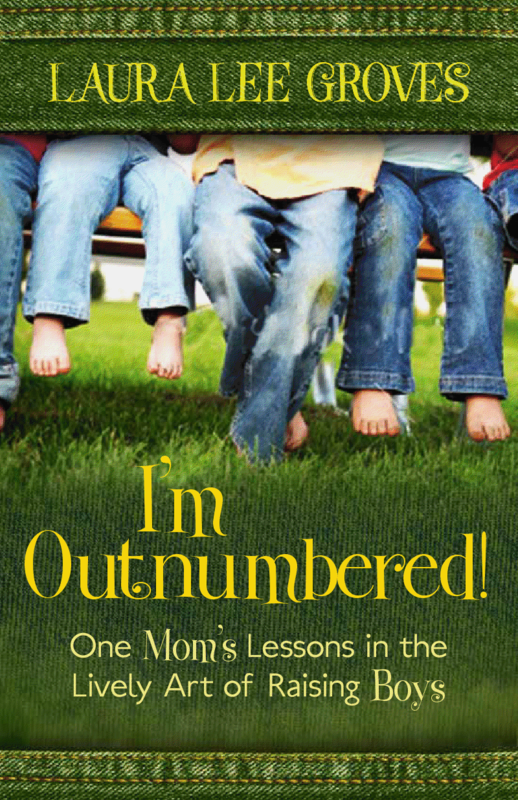 As you probably expect from the title, my book is about feeling outnumbered – in my case, outnumbered by four sons. When you’re the only woman in a household of five guys, life is different, believe me. So boy moms, you’ll be nodding your head as you read. And hopefully, you won’t feel so alone. What about those of you who don’t have sons? There’s a lot in my book about dealing with larger families. Granted, I only had four but that seems big in today’s culture. Keeping a household of six running is a bit different from keeping a household of three on track, and I write about those things. And those of you who have sons and daughters will be interested in what I have to say about what I call the “boys plus” household. When you have a girl in the mix of several boys, life is further complicated, so I address that throughout the book, too. Whether we’re boy moms or girl moms or have a mixture, we moms share a lot. So my hope is that my writing will speak to you no matter where you are. Even if you are in a totally pink household and only know a few boy moms, maybe this book will help you understand (and sympathize) with them a bit more. As I raised my sons, I got so much help from other boy moms. I’d call them daily sometimes with questions! My hope is to share that wisdom, along with insight from professionals. Yes, some professionals have already written about raising boys, but most of them are men. And there are certain things only another boy mom knows – that’s why I wrote this book. On Wednesday, I’ll be writing about the first chapter, Great Expectations. Be sure to tune in! I am so happy for you and this book. I know it will help many mothers. sometimes even one kid you feel out numbered! This sounds like a good read. I'll tune in tomorrow to hear about the first chapter. I'm following you now so I can keep up with your writings. Sneak peaks into your book. Exciting! Congrats on it's upcoming release!! How very exciting! I'm looking forward to reading more! Oh, Laura, I can't wait to hold my copy in my grubby lil' hands! Oh, can I have mine autographed, please? I'm so excited for you! I'm looking forward to the preview. Wishing you nothing but the best as you launch your book, Laura!